Having moved across the ocean from the place where I was born has not always been easy. I do not regret having done so, for I and my family have been greatly blessed but there are things I miss – mainly since I have few relatives on this side of the pond. I as a lad grew up on a farm. A dairy farm to be more accurate and I could not resist the following picture since it reminds me so much of the place that use to be my home. It is painted by French-American artist, Jean Mdina, who studied at the San Francisco Academy of Art. It has an old barn in the background with a dirt lane leading to it . Beside the lane stands a forlorn and decrepit wagon. Well past its days of carrying and transporting. Growing up on a farm I know what a labour it is. A labour of love for one must love this life to live it. All your work and struggle can be set aside by disease, drought, flood, or any number of things which one cannot control. Whether life became to hard or cruel for those who struggled on this farm, I do not know. Possibly life was just better somewhere else. The life of farming is hard but many farmers now have machines to ease the load. Where I grew up, we had close by a group of people called Mennonites or Amish. They farm not with huge hulking machines but with horse and hand. A people who choose not to be laden with the ever crushing burden for ‘bigger and better’. They choose a simpler life close to the land. A harsher, more demanding life but one likely more fulfilling. They work hard. They rely on their relatives and neighbours for assistance. They work together as community to overcome the obstacles which are blocking their path. It is an amazing and possibly even wondrous thing to watch these people at a barn-raising as I have done. Working together as a body they are able to do far far more than we with our huge machines. We could not build a barn in a day but they did. It is a simpler life but harder life. I do at times envy their life as I watch myself run from here to there after some inconsequential thing I’m told I must have. Nick Grant captures so well the charmingly rustic life from the north east of England(Nottinghamshire and area). He brings a sense of tranquillity and a wishful feeling of needing to be in that place. Such is his rendering of image, subtle shading of colour and use of light in his paintings that they evoke this desire for a different life, an easier life;maybe/maybe not, but surely a better one. 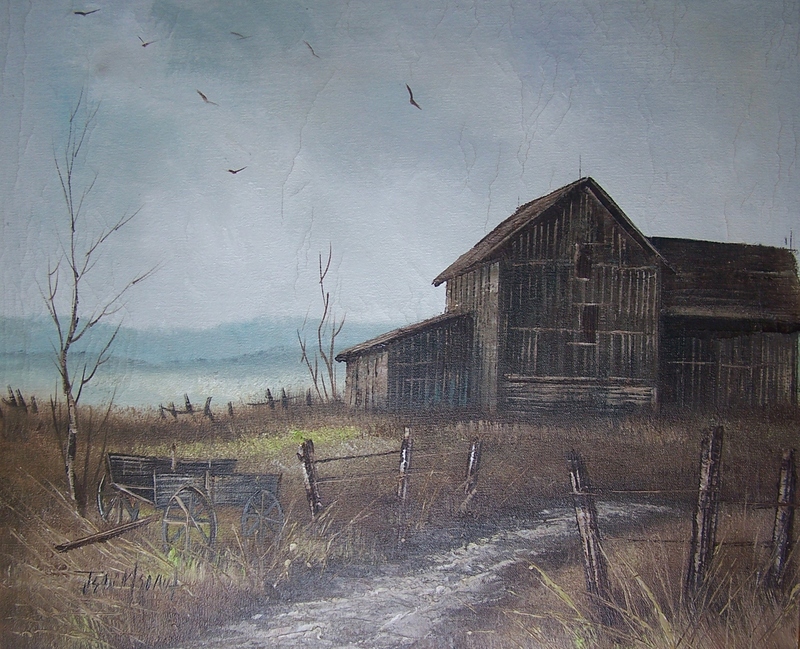 This entry was posted in Oil Paintings, Watercolour paintings and tagged barn, field, horse, lane, plough, rail fence, wagon. Bookmark the permalink.